Let’s get crazy! OK, maybe a podcast from BAI Banking Strategies isn’t crazy, crazy, but if you are into payments, this could be the best 10-15 minutes of the year! 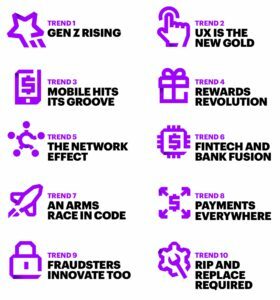 Managing editor Lou Carlozo speaks with Tommy Marshal, FinTech Lead for North America at Accenture about their new payments report entitled Driving the Future of Payments: 10 Mega Trends. 28% of them would give up friends and even money in order to keep their mobile device. 11 times more likely to share payment information than a Baby Boomer. User experience is the new gold standard. In the 90’s, UX was improved every six months or so. Now it’s multiple times daily. Generation X was the Digital Nation. Generation Z in the Mobile Native nation. Think about this…who is designing payment infrastructure? Boomers or Gen Z? Who is designing UX? Is there a mismatch? So many scenarios play out with this information. Strap in for a wild ride and start brainstorming for your business!